"Here in the the UK these kinds of christian films are rarely available. Its good to have christian cinema on the net." Format: DVD - Region 0 What's a Region Code? Inspired from the motion picture,God's Not Dead, this short sleeve tee will affirm your belief in Him while witnessing to those around you. Inspired from the motion picture,God's Not Dead, this Christian baseball cap will affirm your belief in Him while witnessing to those around you. Inspired from the motion picture, God's Not Dead, this short sleeve tee will affirm your belief in Him while witnessing to those around you. Keep your keys together and organized while sharing your faith with those around you with this God's Not Dead black key chain. Teaches us how to fight a good fight of faith. Perfect! Above pair acting. Great! Well worth the money!! Excellent movie!!! Watched it several times before we returned it (rental). Think we'll be purchasing this one!! This was a excellent movie.It was to teach people about faith, showing proff, that Gods NOT DEAD!!! The boy that proved it to the teacher did a excellent job showing it to him.At the end .Well can't tell the end you have to rent the movie.But you will have faith.We loved this . 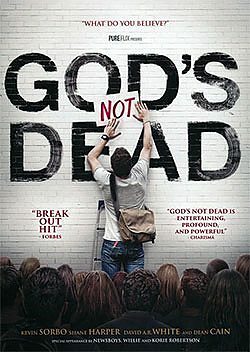 That was a VERY good movie.It is so true God is NOT DEAD!!! It was a well taught lesson on the faith of God and that all you need to do is look to the Bible to see he's not dead.Very Good movie.I'd watch it over again it was so good. Excellent movie!! While the movie had a central path to the Truth, there were several stories to appeal to people at varying stages of belief, disbelief or questioning.